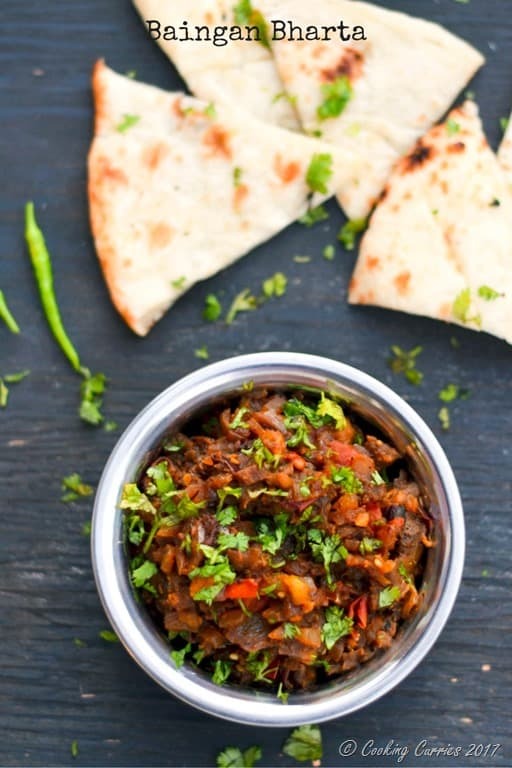 Fire roasted eggplant, mixed with spices makes for a delicious smoky mash that is a great vegetarian side for rotis or parathas and even works as an appetizer dip. Being a South Indian myself, it would feel like I am doing injustice to the delicious cuisine in the southern parts of the country when I say this, but Punjabi cuisine is definitely one of the heartiest and richest food that anyone can ever eat. As with all cuisines, there are different techniques and methods and ingredients that is passed on from generation to generation that makes it what it is. 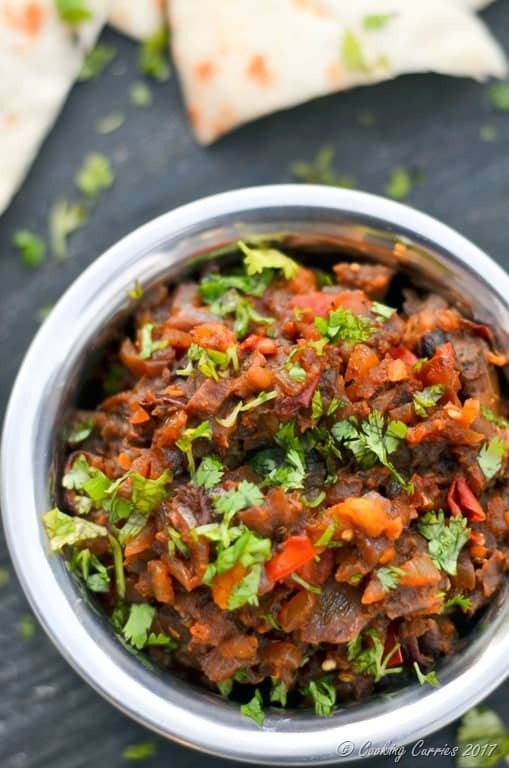 Punjabi cuisine is known for it hearty and creamy dishes like Butter Chicken and Dal Makhani as well as flavorful dishes that highlights the veggies like Palak Paneer, Aloo Gobhi and this Baingan Bharta. And then we wash it all down with some good, creamy and frothy lassi. 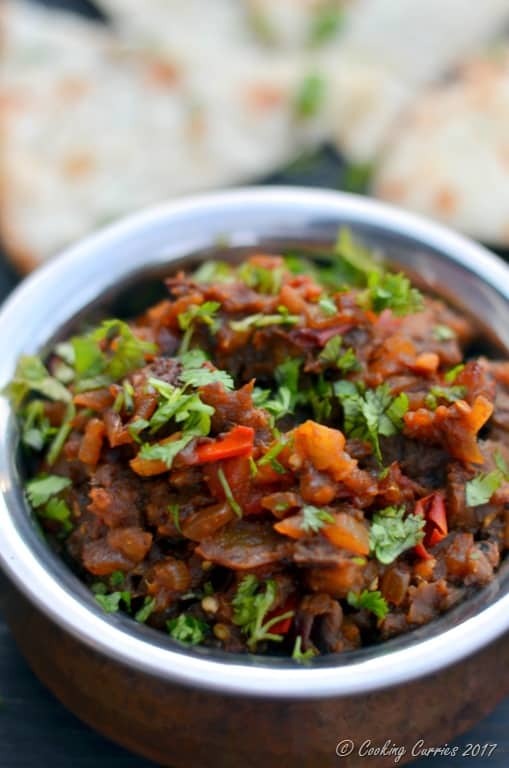 In this Baingan Bharta, baingan or eggplant is roasted over open flame till its cooked all the way through, peeled and mashed together with some spices. Some roast the eggplant in the oven but it does not quite give it that smokiness that is its very characteristics.I suggest that you roast it over your gas stove and if you don’t have a gas stove, then at least an outdoor grill. If that is also not an option, then try the oven roasted method. Also, some add green peas to this, but I love it with just eggplant in it. This is served as a side with rotis or naans or parathas along with some dal on the side. Wash and pat dry the eggplant. Poke around the surface with a fork and roast over an open flame on a gas stove rotating every once in a while, till the skin is all charred and the eggplant shrinks. Keep aside and let it cool. Once cool, peel off the skin and mash the rest of the cooked eggplant. Heat the oil in a kadhai / heavy bottomed pan, add the onions, garlic and ginger. Let it sauté till the onion softens. Add the turmeric powder, cumin powder, coriander powder, cayenne and tomatoes and cook till the tomatoes soften and the oil separates from the masala. Add the mashed eggplant and salt and cook for a few minutes. Remove from heat, squeeze the lime, mix it in and garnish with cilantro. 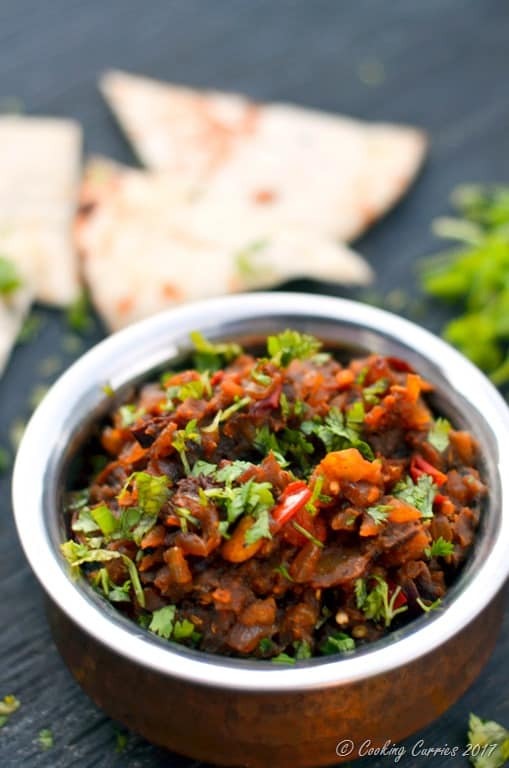 Serve hot with rotis , parathas or naan along with some simple dal. Pinning this for sure! It looks amazing and would pair so well with pretty much EVERYTHING! !